Cambridge professor Christopher Andrew has written 'The Secret World: A History of Intelligence,' a book that despite a few flaws, proves to be a definitive account of the role of clandestine intelligence gathering played in world history. It’s hard to believe that there has been no serious book-length history of the world of secret intelligence to date. While there exist Big Book of Spies type things, along with detailed histories of intelligence organizations such as the CIA, the KGB, and Mossad, a scholarly study covering the overall history of intelligence, its practice, and its influence, has been conspicuous by its absence. 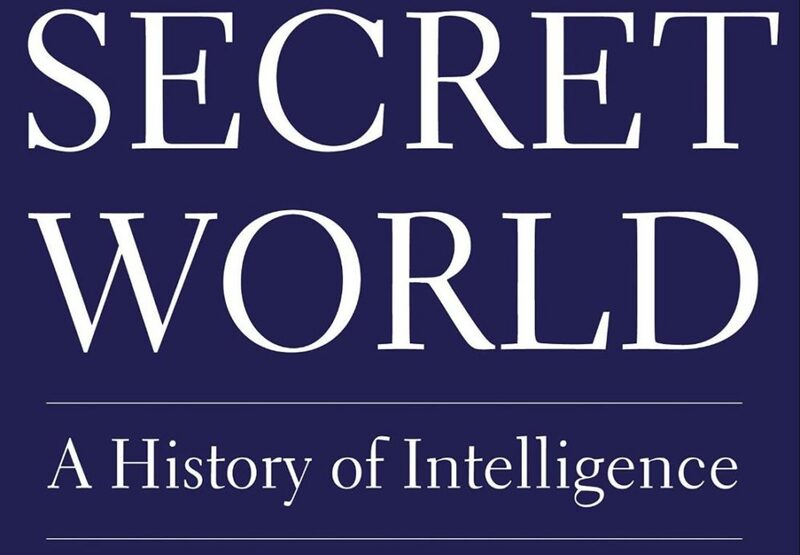 With the release of The Secret World: A History of Intelligence by Yale University Press, Christopher Andrew has made a conscious effort to recover what he refers to as the “lost history” of intelligence. Andrew, an emeritus professor of history at Cambridge, was unquestionably the man for the job. In 1999, he published The Sword and the Shield: The Mitrokhin Archive and the Secret History of the KGB, a book resulting from the most serious intelligence breach the KGB ever suffered. More recently, he published Defend the Realm: The Authorized History of MI5. No other contemporary writer matches Andrew’s record of bringing the shadowy world of intelligence into the light. Andrew discovers the roots of intelligence-gathering in the Old Testament, when it was practiced under divine guidance. During the exodus, Moses was commanded to send a dozen spies into Canaan, to learn how much difficulty the Hebrews would encounter in taking the place. Although Moses’ spies returned successfully, they were divided in their assessment of the Canaanites, several of them lying outright: “the Canaanites included giants who made them feel no bigger than grasshoppers”—the first known case of intelligence operatives shading their findings to fit an agenda. This led the Israelites to defy the Lord’s command to invade Canaan, resulting in another 40 years spent wandering the wastelands. The other ancient culture to take intelligence seriously was China, largely due to the influence of the master strategist Sun Tzu, whose strategy of victory through deception required accurate, dependable intelligence. Lengthy sections of The Art of War deal with spies, their types, their treatment, and how to use the intelligence they produce. Intelligence has been taken seriously in the East across all the millennia since. In contrast, the West neglected intelligence, instead turning to oracles, seers, and squadrons of sacred chickens. Almost all Greek leaders, both political and military, relied on oracles for political and military decision-making. Oracular institutions such as Delphi became expert in producing ambiguous statements that nonetheless told the petitioner exactly what he wanted to hear. (As in the well-known case of Croesus of Lydia.) It’s appalling (and even comical to modern eyes) to learn that the cradle of rationality and philosophy was so enthralled by such nonsense. Xenophon is almost the sole ancient military thinker in the West to recommend the use of spies. This carried over into the Roman era. Rome did use spies, in the form of delatores, that is, informants, but almost solely for internal social and political control. For military and foreign matters, it was back to the entrails. Even more so than the Greeks, the Roman view of spies was characterized by open contempt, an attitude that led repeatedly to disaster. Both the Teutoburg Forest massacre (9 A.D.) and the Iceni Rebellion in Britannia (60-61 A.D.), led by the redoubtable Boudicca, could have been avoided with reasonable efforts at intelligence-gathering. This failed to change in the later imperial period, with lack of useful intelligence contributing to the decline and collapse of the Western Empire. Ignorance about the size and capabilities of the invading Visigoth army led to the rout of Valen’s imperial forces at Adrianople in 378, one of the defeats that put Rome under. Intelligence returned to a central place with the rise of Islam, likely, although Andrew doesn’t emphasize the point, yet another Arab borrowing from the Hebrews. The Koran makes clear that Mohammed had nothing against spies, using them effectively against rival Arabian tribes. This tradition was carried on by Mohammed’s successors, playing a large role in Islam’s lightning conquests of the Middle East and North Africa. The tradition remains alive today in al-Qaeda and ISIS. The Medieval period saw intelligence reassert itself in the Western world, at first largely as an instrument of social control through the Inquisition. At the time, heresy was not merely a matter of doctrine, but a threat to the social order itself, of such a nature as to justify any means in combatting it. Many of the methods and techniques utilized against subversion in the centuries since— perceived or real—had their origin in this period. The Republic of Venice is another example of intelligence as tool of political oppression. The governing Council of Ten utilized a near-Orwellian system of mutual surveillance, encouraging denunciations by citizens through a network of “lion’s mouth” (bocca di leone) letterboxes. At the same time, Venice pioneered foreign intelligence methods in maintaining its vast Mediterranean commercial empire. Venetian diplomats were notorious for the role they played in intelligence collection. The Renaissance witnessed the maturation of what today is known SIGINT—intelligence derived from enemy messages and signals. While the ancient world had depended on simplistic substitution codes, Renaissance scholars such as Giovanni Soro and Leon Battista Alberti developed advanced principles of both encryption and decoding, triggering a centuries-long arms race between encoders and decryptors that played an ever-expanding role in intelligence work and has extended down to the quantum level today. Along with an intricate domestic intelligence apparatus, Walsingham operated one of the largest spy networks of his era throughout the states of Catholic Europe, employing everything from renegade priests to atheist playwright Christopher Marlowe. (Among the earliest of an impressive number of artistic types employed by the intelligence world, including Aphra Behn, Peter Paul Rubens, and on down to Compton Mackenzie, W. Somerset Maugham, and, needless to say, Ian Fleming). Walsingham could be looked upon as the first of the ideological spymasters, the forerunner of such figures as Fouché, Dzerzhinsky, and Beria. That intelligence could also be used for national liberation was demonstrated by none other than George Washington. Along with his status as strategist and statesman, Washington was also a superb spymaster. While the story of Nathan Hale is well known, that fact of dozens of more successful spies, most of them under Washington’s direct control and some unknown to this day, will come as a revelation to many readers. Washington set a standard for understanding and use of intelligence that remained unmatched among succeeding presidents. With the French Revolution we move into the era in which we are still enmeshed, one in which large-scale ideological threats, both internal and foreign, have resulted in security establishments that influence—and sometimes dictate—governmental policy at all levels. This was far from intentional. It evolved on its own, as a response to events. In the wake of revolutionary impulse, it simply became impossible for a nation to survive without a massive security structure. Governments in the 19th century contended with an endless parade of socialists, anarchists, Chartists, nihilists, Marxists, and assorted nationalist and ethnic activists. Andrew lends this confusing and at times nearly opaque story more clarity than might be expected. This is an era needs to be understood—it’s during his period that the attitudes, techniques, and concepts that still prevail in the secret world came into existence. With the 20th century, we move into more familiar territory, the landscape that includes MI6, MKUltra, Bletchley Park, the KGB, Alger Hiss, Magic, the CIA, and so on. Andrews deals with this well-known material clearly and succinctly. There are even a few surprises here, for instance the fact that the Soviet effort against the Manhattan Project was far more comprehensive than previously believed. Along with the infamous Rosenberg ring, two unrelated agents, Arthur Alexandrovich Adams and George Abramovich Koval, also penetrated the atomic bomb project. Although both were made Heroes of Russia, they’re nearly unknown in the West. There is surprisingly brief coverage of the Cold War, a conflict largely fought by means of intelligence. The crucial role of defectors goes nearly unmentioned, and next to nothing is said about the U-2 program or the Corona reconnaissance satellites, which revolutionized the use of imagery intelligence, raising it to a level at least coequal with all other forms of information-gathering. Although Andrew does discuss the end result—that no nation can prepare and initiate a major war without being detected—he neglects to tell us how this came about. There’s an understandably incomplete chapter on intelligence in the War on Terror, which contains little new and leans toward the pro forma. Here too we find a few odd omissions. Although Andrew thoroughly discusses “the Wall” that prevented information-sharing between the FBI and CIA that might have prevented the 9/11 attacks, he fails to mention the individual primarily responsible for the policy, Jamie S. Gorelick, or that she was also member of the 9/11 Commission that investigated the attack, a fact that raises questions that will probably never be answered. But at the same time there’s very little in the way of context or judgment here, even though the material is often begging for it. The concluding chapter, where something of the sort might be expected, is instead devoted to topics not covered elsewhere—Israel and China, largely, along with too many pages devoted to the “intelligence failure” concerning Iraqi WMDS, which certainly can’t be held as a complete failure, since it led to the exposure and shutdown of Muammar Qaddafi’s illicit nuclear program. This is a serious fault. We are today at a point in the development of the secret world where intelligence agencies have begun attempting to gain complete political control of the states they were founded to serve. Russia has become the personal fiefdom of a former KGB officer—a fact that goes unmentioned in The Secret World—who has reintroduced that organization’s worst excesses, including assassination, as standard elements of national policy. In this country, the intelligence establishment, both foreign (CIA) and counterintelligence (FBI) has blatantly interfered in domestic politics by their handling of issues related to the 2016 presidential election. Nowhere in The Secret World does Andrew address this, though there is plenty of evidence scattered throughout that these are neither novel nor rare situations. We’ve clearly entered a dangerous epoch with regard to national security organizations. So the questions arise: Is this inevitable? Do powerful intelligence establishments always distort their host societies? Must foreign information-gathering always encourage domestic security abuses? What steps should be taken to curtail such abuses? What lessons does history have for us? Andrew has not addressed any of this, though much of it is inherent in the history he covers. The Secret World is a very fine book, a necessary book, a book that needed to be written. But it’s only the first step. The secret world has many more secrets to reveal. J.R. Dunn is a novelist, military historian, and political commentator. He is consulting editor for American Thinker.